Last week I found myself smack dab in the middle of The Name Game. For those of you too young to remember The Name Game, although it sounds like a television show, it wasn’t. 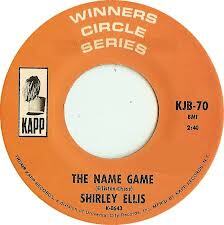 The Name Game was a song that was popular back in the 60’s. Although it was pretty ridiculous ,it was catchy and somewhat of an ear worm. For those of you unfamiliar with the term ear worm it’s a song you should run screaming from because once it gets into your head, you can’t get it out. It bores into your brain and you find yourself humming, singing, whistling – whatever – all day long. Ear-worms are patient. They can lie dormant for long periods of time, but once awakened – watch out! 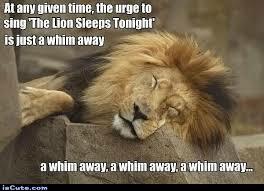 The Lion Sleeps Tonight has been dozing in my head since high school. Drat, now I’ve gone and let him out! but bear with me, this is all germane to my story. …………OK on to ……….tada !!! !……..my story…………. I was speaking to a young lady recently. Her name was N. Lipscombe. I immediately thought of Sharon McLean, my bestest BFF in all the world back in fourth grade. I thought of Sharon because she had a cousin named Rudy Lipscombe. I asked Ms Lipscombe if she had a grandfather by that name (sigh yes, grandfather, time marches on) Her face lit up and she said she did have a great-uncle (double sigh) who passed away a couple of years ago (triple sigh), and although Rudy wasn’t his given name she thought he may have gone by it. I told her I didn’t think Rudy’s given name was Rudy, either but I didn’t remember what his real name was. Young fashionable Aunt Fannie who had a handsome boyfriend. And oh, yes – Uncle Robbie who was in the Air Force and brought home a real German wife — with an accent and everything! Can you tell I spent a lot of time at Sharon’s? It wasn’t until I arrived home that afternoon that the most important name popped -into my head – Giscombe. Rudy’s last Giscombe – not Lipscombe!. If you recall, back in January, I posted a blog titled Wood you Believe Number 19? If you don’t here it is. I’d related how the USPS deposited a Christmas card addressed to #19 Wood……. in my #19 Wood………mailbox. The only problem was the sender in Hialeah Florida thought it was en route to #19 Wood……. in Jamaica West Indies. I felt bad since the sender had gone to the trouble of going to the airport and spending the money needed for foreign air mail postage. So I put it in an envelope along with a note explaining why it was arriving late, and went to the post office (Not the one that had obliviously delivered the wayward card) and sent it on its way to Jamaica. Happy ending to the story — or so I thought. I stopped at my #19 mailbox a few weeks ago and extracted a large card addressed to #19, and immediately my eye went to the colorful stamps. 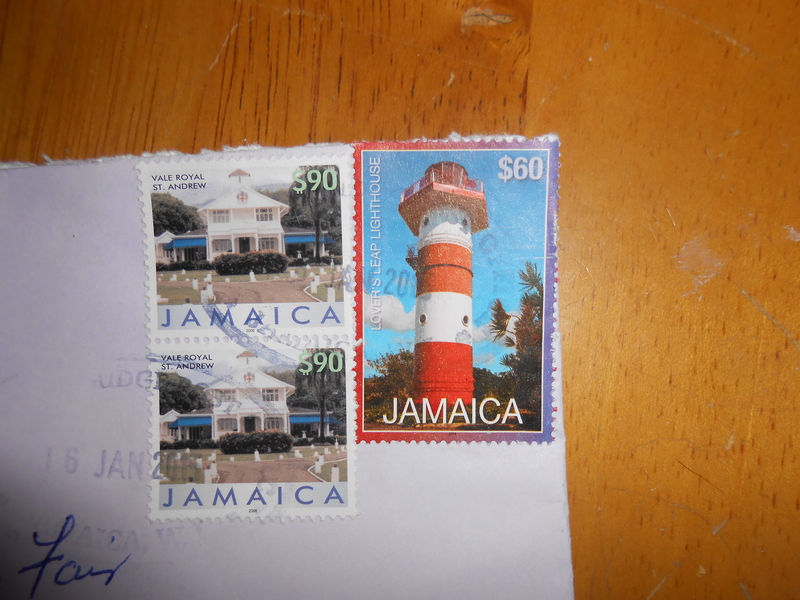 It was from Mrs Enid Wiggams, who resides at #19….. in Jamaica. She added a lovely note and made a point of including her address. Do you think it was a hint she’d like a Christmas card next year? 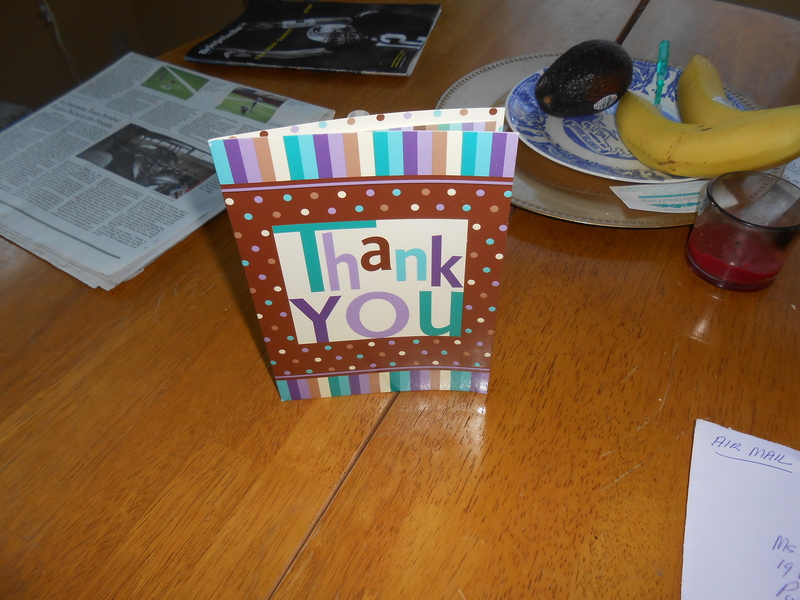 Probably not, but I’ve saved the card so I can send her one.